One match each day live on BBC TV, streamed online & available through iPlayer; live text commentary online and on mobiles via BBC Sport website; every singles match live on 5 live sports extra. 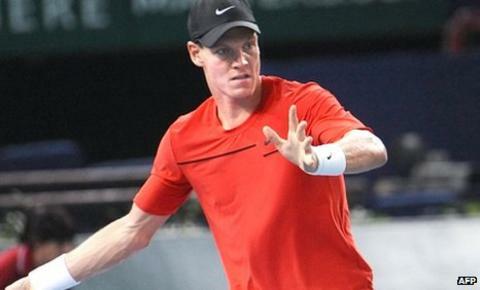 Tomas Berdych beat Janko Tipsarevic 7-5 6-4 to set up a Paris Masters quarter-final against Andy Murray - and book his place at the ATP World Tour Finals. The result also sent Jo-Wilfried Tsonga and Mardy Fish through to the 20-27 November event at London's O2 Arena. With Novak Djokovic, Rafa Nadal, Andy Murray, Roger Federer and David Ferrer already qualified, the line-up for the season-ending tournament is complete. Federer overcame Nadal to win the title for the fifth time in 2010. London is hosting the finals for the third successive year, with its contract running until 2012. At the draw on 15 November, the eight players will be divided into two groups of four, contesting round-robin matches against each of the other three men in their pool. The two players with the best records in each group advance to the semi-finals and the winners go on to meet in the championship match. In 2009, the first year it was staged in London, Nikolay Davydenko triumphed over Juan Martin del Potro in the final. For the latest updates throughout the day follow Sportsday Live. Get involved on Twitter via the hashtag #bbcsportsday.